"Culture" -- a means by which a way of life is transmitted from one generation to another by language or symbols -- was tedious before the alphabet, sketching and the creation of symbols were codified and literally, "cast in concrete." 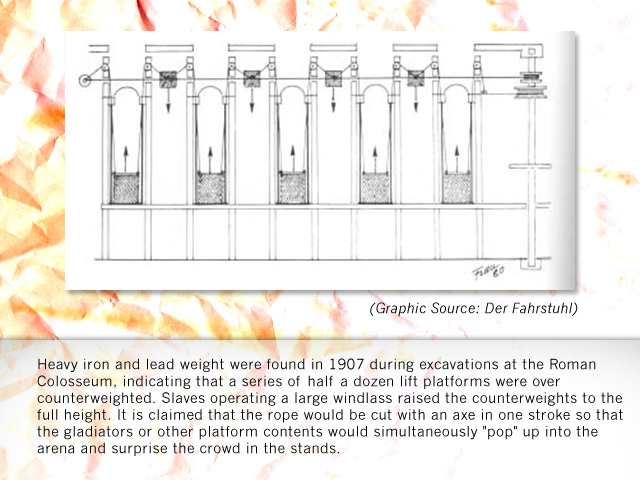 Lifting had its place of importance in the understanding of past cultures for the great monuments left behind through centuries could not have been created without an ever-greater understanding and application of the elevating science. 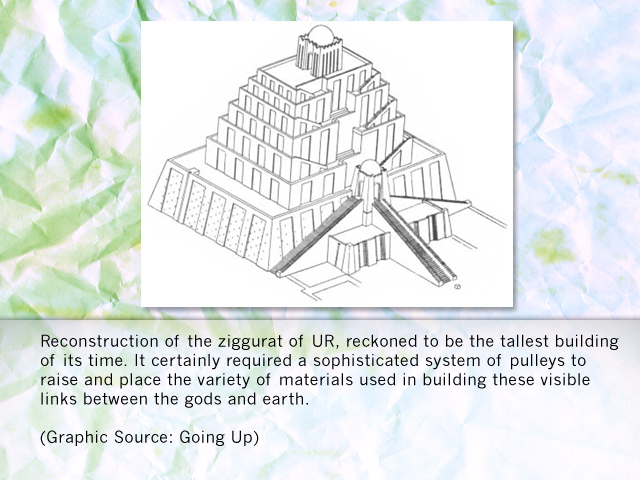 At first, the monuments were basic, stressing height and massiveness -- a Tower of Babel, ziggurat or pyramid. 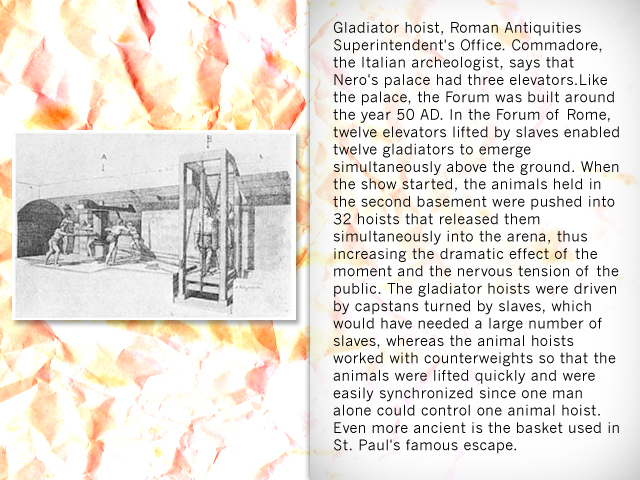 Elevating was required no less as artistic skills developed and great pieces of statuary had to be hoisted. With the coming of leisure time, and the penchant of the aristocracy to placate the mass of citizenry, huge amphitheaters were built and lifting became central to the entertainment. 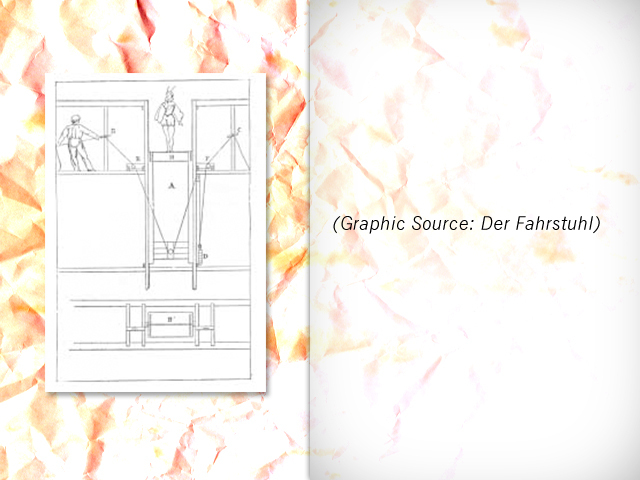 Artistic expression for the elite also made use of lifting devices, adding elegance and surprise to the presentation. When religion became the primary means by which culture was passed down through generations, the emphasis was upon building large churches and cathedrals ­ the higher the rank of the sponsor -- royalty or bishop -- the more magnificent the latter structure and greater the need for years of elevating materials." With culture being the manner in which a way of life is transmitted to future generations, the written word and graphics as an effective means were augmented by two categories of monuments -- secular and religious. The former commemorate the standout individuals and events of a particular generation. In times of struggle, a general or political leader might well be memorialized. In other periods, builders of a society might be cast in bronze or chipped from stone. A monument may express adherence to an ideal; witness the Statue of Liberty off the tip of Manhattan. The Eiffel Tower was named for its builder and to this day architects, engineers and politicians hasten to have their names engraved upon the cornerstones of monumental structures! 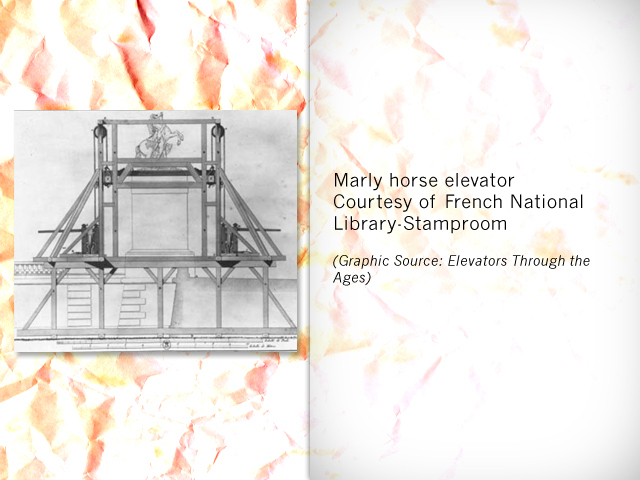 The Washington Monument, Eiffel, CNN and other high towers found lifting equipment a necessity -- in the construction phase -- and, thereafter, when the monument's height provides a panoramic view. Whereas a builder in our time may place his name upon a monumental building -- Chrysler or Trump -- such structures in history were also named for individuals, locations or functions -- consider the Ancient Seven Wonders of the World -- soaring structures, including: the Pillars of Hercules at Gibraltar; the Great Pyramid of Khufu with the Sphinx; the Colossus of Rhodes; the 40-foot-high statue of Zeus (Jupiter) at Olympia; the Pharos Lighthouse at Alexandria and the Hanging Gardens of Babylon (75 feet above the ground and irrigated by screws lifting water from the Euphrates! Who can say where entertainment begins and "art" begins? Or where they merge? Throughout history, Art has been sponsored by patrons and enjoyed primarily by the elite while entertainment for the most part has been created for the masses. Often fought to the death the entertainments of the Roman emperors within the Coliseum placated the mass of the citizenry, being one half of the "bread and circuses" provided -- entertainment a bit more brutal than the professional football and hockey contests so avidly attended in our own day. 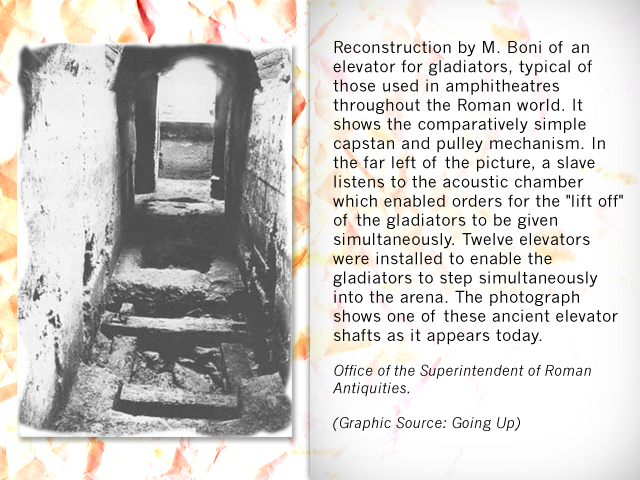 Lifting played its part within the Roman Coliseum. 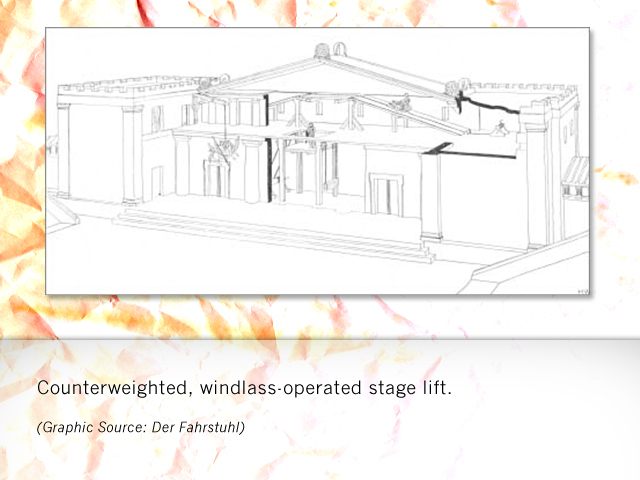 The theater is emblematic of the artistic presentations supported and enjoyed by the artistocracy through the eras, the lifting of a cast member to stage level being the sophisticated equivalent of the gladiator being hoisted to an uncertain future! 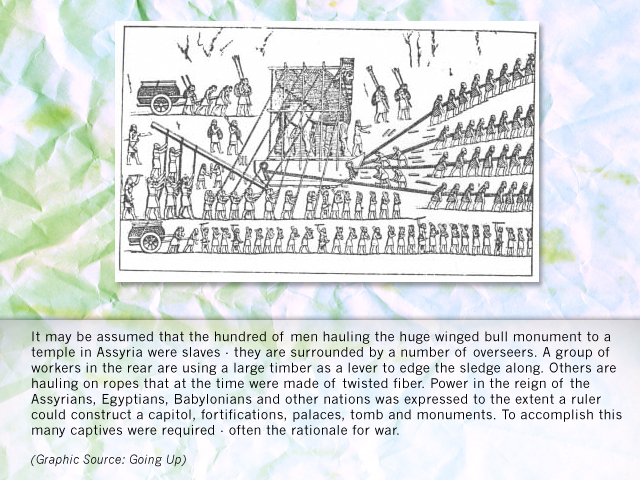 The political leaders relished being the center of attention at the mass entertainments; after life on earth, they perpetuated their regimes with the erection of statues and monuments -- which again required more heavier lifting. 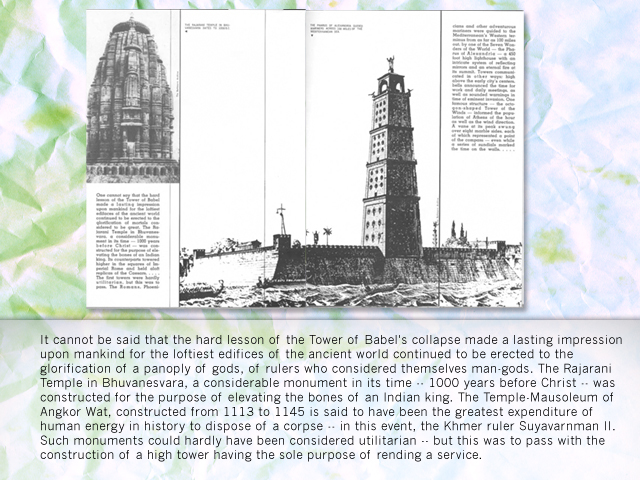 Monuments, as well as being secular, sought to acknowledge the existence of gods, or God. They were erected as an act of worship; a desire reaching out for kinship. Those dedicated to a panoply of idols and Olympian gods gave way to the monotheism of Akhenaten, King of Egypt, during the Eighteenth Dynasty. The worship of many idols was disabused by the Hebrews and the idea of the One God emphasized and disseminated, The adoption of Christianity as a religion, supported by the Roman Empire, stimulated the building of churches, then cathedrals. The simple one room baptisteries, then the parish churches, required little lifting. However, as the wealth and influence of the Church and governments of state grew, the cathedrals, seats of the bishoprics, became more elaborate, soaring ever-higher. These lofty and complex structures requiring a new breed of skilled craftsmen -- designers, masons, stained glass makers, carpenters and tile setters -- and those steeped in the art of hoisting materials. Each head of state and bishop sought to create the tallest and most richly adorned structure as a mark of distinction and power. As an example, the Cologne Cathedral, begun in 1166, took 634 years to complete, at which time it was the largest Gothic cathedral in Northern Europe. 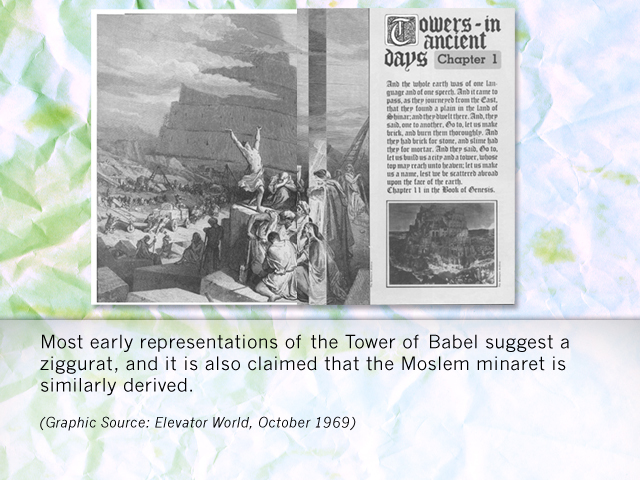 With twin towers 515 feet high, it was the tallest structure in the world, a distinction it held until 1889. The equivalent contesting in our day would be in building the world's tallest commercial skyscraper!